Preset menus and drinks not included. Available on the booked timeslot. Joseph is a bistro with an Asian twist. Choose between a great variation of fish- and meatdishes, but no worries vegetarian, for you there is choice enough! And we have a nice to know for you: Joseph has always nice beer- and winetastings on their planning, definitely check out their event calendar! Was erg lekker. Zeer gevarieerd en prettige bediening. Real nice restaurant, friendly waiters. We started with a drink and wordenful brown bread. The restaurant has a fine card of genuine Thai dishes, fish, and all kinds of meat. Starters and main dishes are fairly priced. I really can recommend Joseph for dinner. 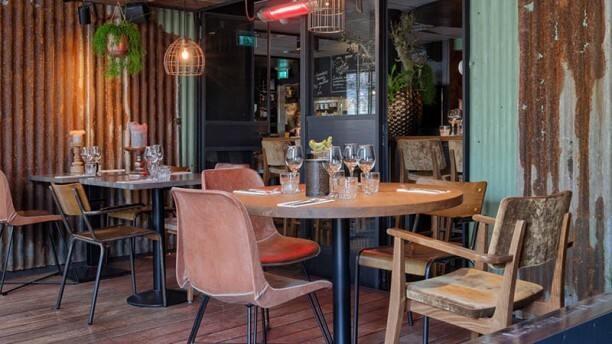 Vaker gedineerd in dit restaurant en elke keer tevreden huiswaarts gekeerd. Vriendelijk en nette bediening ! Dit restaurant is een aanrader! First course lacked salt and was way too dry. Second course choked on salt and gave me cramps and a bloated feeling for the rest of the night. A shame, since the deer was prepared suberbly, but drowned in the salty, sticky mush. Desert was ok.
Service continued to place the wrong food and drinks with the wrong people, despite pointers. They seemed understaffed that night and did their best. It took ages for the main course to arrive. Sometimes a bit too pushy on wanting to sell me drinks; pouncing me more than offering and showing annoyance at us not buying as much as apparently hoped for. I guess I was unlucky, since the place is always packed, or my cooking skills and expectations far exceed theirs.